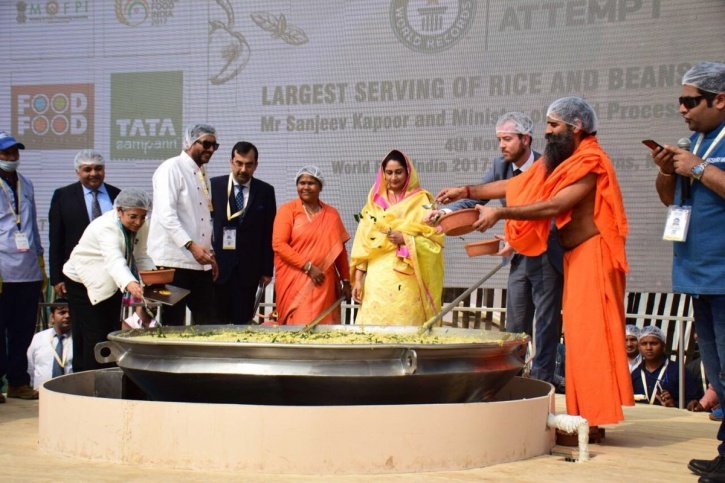 New Delhi: India today set a Guinness world record by cooking 918 kg khichdi, a traditional multi-grain dish, at the ongoing global food event organized by the government in the national capital. 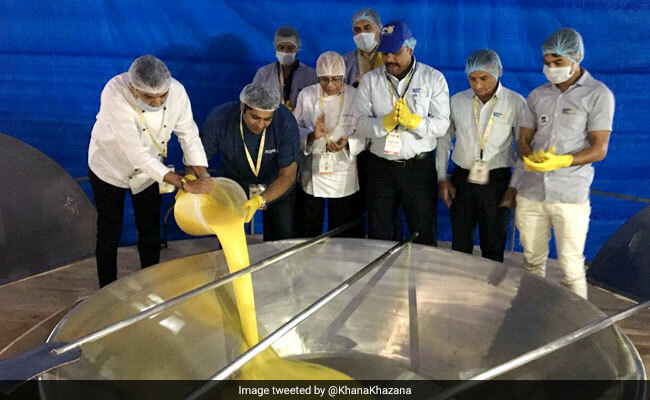 A team of 50 people led by celebrity chef Sanjeev Kapoor and NGO Akshaya Patra supervised the night-long preparations and yoga guru Ramdev Baba put crowning 'tadka' in the dish at the World India Food event that will conclude tomorrow. Khichdi was steam-cooked in a giant wok weighing around 1,200 kg. Out of which, the wok alone was weighing 343 kg. The dish was prepared using multi-grains like rice, pulses, coarse cereals and vegetables. "We are still waiting for a few pieces of evidence. For the time being, I am happy to announce that this (khichdi) wins the Guinness World title weighing 918 kg," Guinness World Records' Project Manager Paulina Sapinska said at the event. The minimum requirement to create a world-record was 500 kg. The cooked dish, however, weighed more than the target of around 800 kg set by chef Sanjeev Kapoor. Other leading chefs, including Imtiaz Qureshi, Ranveer Brar, Sudhir Sibal, Rakesh Sethi, Akshay Nayyar, Satish Gowda, too helped in the cooking of the dish. "Khichdi is a healthy and superfood. It is a solution to those depending on food supplements. It is rich with all nutrition," Baba said after putting tadka in the dish. Promoting khichdi as a 'Brand India' food is a good step towards promoting healthy superfood not only domestic but also international market, he added. Food Processing Minister Harsimrat Kaur Badal Minister, who also lent a hand in the cooking of khichdi, said: "It is a wholesome food as it contains most of the nutrients. It also symbolizes the country's unity in diversity." The khichdi will be distributed to orphans by Akshaya Patra Foundation and Gurudwara to about 60,000 people. "We promote international foods in India and it is our opportunity to showcase our superfoods to the world," said Kapoor, who is also a Brand Ambassador of The Great India Food Street at the event. Qureshi, master chef at ITC Hotels, praised the government's initiative to promote Indian foods like khichdi and recognize the talent of Indian chefs. He said that new-age chefs are innovating this dish across the world and is being consumed in an interesting way these days. Minister of State for Food Processing Sadhvi Niranjan Jyoti, Denmark Food Minister Esben Lunde Larsen, ITC CEO Sanjiv Puri, Tata Chemicals COO of the consumer business Richa Arora, LT Foods Chairman Vijay Arora and Akshaya Patra Foundation officials were also present at the event. The mega khichadi preparation was part of the 'Great Indian Food Street' at the global event, being organized along with industry body CII, that features traditional food from more than 20 states.